As people of faith, we believe that our children were created by a loving God. God created them (and us) from love, for love, to love. Our task as adults is to help our children, from infancy on, to realize that their very life is a love gift, and to teach them -- year by year, day by day, hour by hour, -- how to love – how to love themselves, how to love others, and how to love God. Central to this task will be helping them, as they approach the teen years, to understand their developing sexuality, and to make the kinds of choices and decisions that will lead to truly loving relationships in their lives. Learning about L.I.F.E. is a family-based program. It is designed to guide parents in the most important task of their lives – raising good kids. All parents want their children to be kind, generous, independent, and loving. They want their children to know how to get along with others, to make good decisions, and to grow into responsible, loving adults. about how to avoid getting caught in relationships that are negative and destructive. The L.I.F.E. 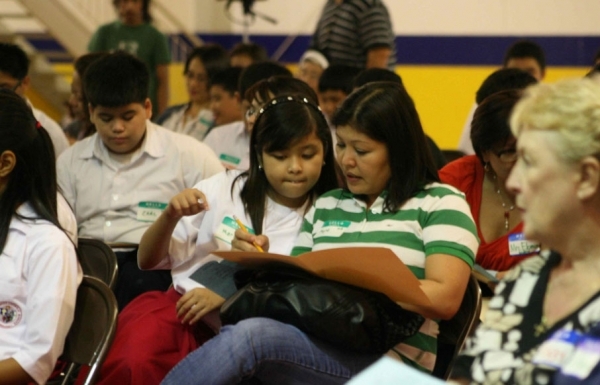 Program offers one parent-child session for each age level, from pre-school through senior high. The sessions are held in the school or parish hall and last from about 45 minutes for the younger children, and 1½ or 2 hours for the pre-teens and teens. Each session consists of engaging, interactive, age-appropriate processes directed by a trained facilitator. The processes make it fun and easy for the family members to talk to one another. The topics covered in these sessions include loving relationships, character development, sexuality, chastity, and abuse prevention – always handled according to the age-level of the children, and always in the context of faith, morality, and prayer.